There are many different types of 'turquoise' and sometimes what you're buying just refers to the color. I grew up in Southern California and 30-35 years ago, I used to travel to a few turquoise mine sources in Nevada and the desert southwest. I don't think many mines are open to the public these days and I still have some of that beautiful, natural turquoise. I won't be parting with it any time soon! As a gemologist, it's good to be able to put some of my knowledge to use! Here is some information about the turquoise gemstone, its origins, treatments and characteristics that may help you when you consider purchasing it or using the popular stone in your jewelry designs. Most turquoise is unstable and must undergo some sort of process to make it acceptable and durable for use in jewelry. Because it's generally a soft and porous stone it can undergo changes in color and texture like fading or falling apart when exposed to things such as perspiration, sunlight, perfumes, soaps etc. Hence the need for stabilization. Turquoise is found in several major sources around the world, from here in the US, (Nevada, New Mexico and Arizona and even California) China (which does have some very beautiful gem-quality turquoise), Egypt, Afghanistan, Iran, Africa, and Mexico. Two of the world's oldest known turquoise mining areas are the Alimersai Mountain in Iran and the Sinai Peninsula in Egypt. Turquoise's lovely blue color comes from the presence of copper in the gem material and turquoise production is often a product of copper mining with the gemstone being a secondary mineral to the copper. Turquoise is a hydrated phosphate of copper and aluminum and is formed by the percolation of groundwater through aluminous rock in the presence of copper. A word of caution. Because of its porous and fragile nature, never tumble jewelry containing turquoise. And when oxidizing, be sure to protect the turquoise so that it does not come into contact with any potentially damaging chemicals. I think the word "turquoise" is used pretty freely in the jewelry world. It can be very difficult to tell just exactly what you are buying - genuine turquoise or a pretty blue stone or compressed chaulk that has been rolled in turquoise colored wax. I actually accidentally bought some of this chalk stuff one time not realizing what it was, and while it looked nice at a glance, it was good only for coloring paper. 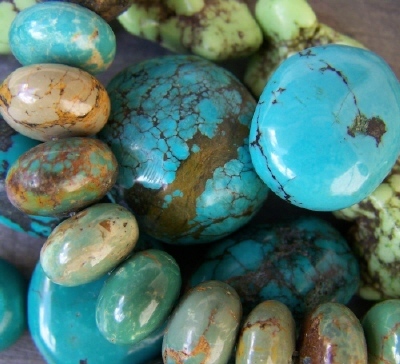 I think it is best when purchasing turquoise to know your supplier. There's nothing wrong with buying dyed howlite, reconstituted turquoise, etc. as long as whatever you're purchasing is honestly represented so you know exactly what you're getting. High-end turquoise like the very beautiful robin's egg blue Sleeping Beauty variety is very expensive. So usually, better quality equals a higher price. I hope you can go forward with your eyes more open and with a better understanding of what you're buying and using for your jewelry projects. Here are some common terms and treatments. The information below was provided by the folks at Thunderbird Supply company. A hard turquoise which is treated with varying electrical currents that harden the stone, and enhance the color of the turquoise. No dyes, resins, waxes or oils are used. Enhanced turquoise will not change color over time. Impregnated with acrylic or epoxy to harden the stone and enhance the color. Stabilized turquoise will not change color over time. A common method to stabilize turquoise is to impregnate the stone with hot acrylic resins using pressure. These resins improve the hardness, durability and color. This treatment makes is possible to use inexpensive porous and colorless material for use in jewelry. It is important that this material is represented as what it is. A treatment that uses pressure to harden the stone. The stone is treated with a fracture sealer which hardens the matrix in it. Stone produced in the laboratory, which exactly reproduces the chemical composition and physical characteristics of the natural stone. Process of taking pieces of turquoise; chips powder or low grade, mix with an epoxy resin, add dye, then compress into blocks. Blocks can then be cut into different forms: beads, cabochons, carvings, flat slabs for inlaying. Percentage of actual turquoise to resin material varies greatly from each manufacturer. Reconstituted turquoise has a distinctive odor due to the resin content. Return from "Turquoise" page to "Jewelry Making Tips & Techniques" page.